Knowledge of foreign languages in today’s world is believed to be an integral part of the image of high achiever. 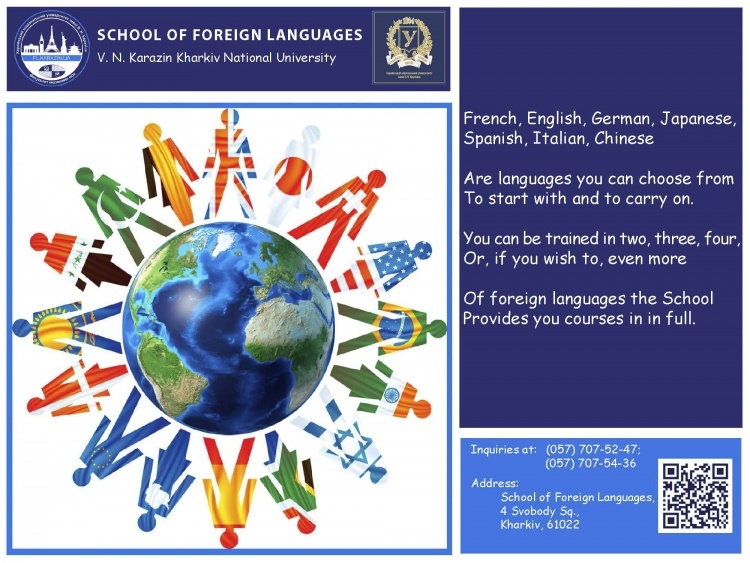 Mastery of foreign languages broadens your worldview, enables you to understand cultures and customs of other nations, opens up almost limitless possibilities in communication and establishment of professional connections. 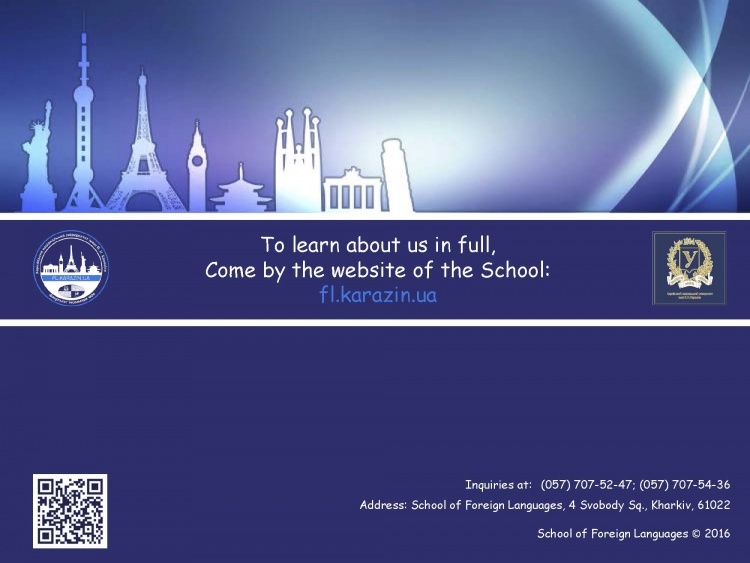 The School of Foreign Languages of Karazin University ensures high quality training in foreign philology under Bachelor’s, Specialist’s and Master’s programs in the majors of “Language and Literature” and “Translation”. The School teaches English, German, French, Spanish, Italian, Chinese and Japanese. Besides foreign languages the School’s students master fundamental and career-oriented disciplines. They are Introduction to Linguistics, History of Foreign Literature, Latin, Lexicology, Theoretical and Comparative Grammar, Stylistics, Culture-Oriented Linguistics, Translation Theory and Practice, Information Science, Education Science, Foreign Language Teaching Methods, Speech Culture, etc. 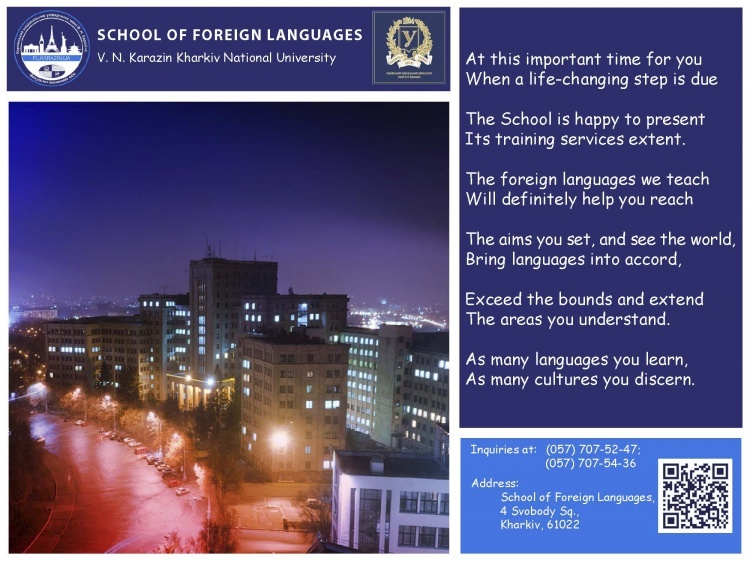 Training of students at the School of Foreign Languages is ensured by over 200 leading specialists including 14 doctors of sciences, full professors, and 64 candidates of sciences, associate professors. Academic activities are organized using modern multimedia applications and technical aids: students of the School have at their disposal two computer labs, a simultaneous translation laboratory, a methodological center, etc. 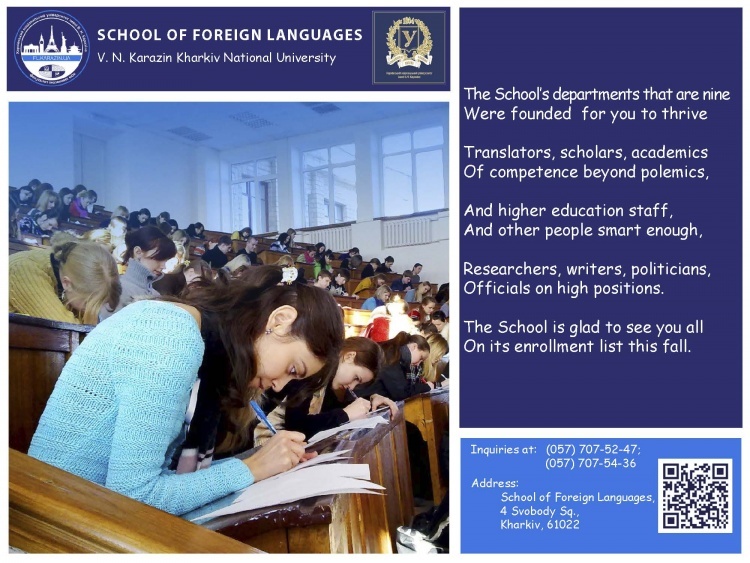 International scholarly cooperation at the School of Foreign Languages is also diverse: participation in collective grants under the program “Encouraging Development of Germanic Studies in Central and Eastern European Countries”, individual grants from R. Bosch and Fulbright Foundations, German Academic Exchange Service (DAAD) and French Government Foundation. 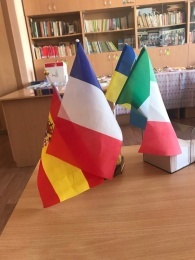 The School has entered into cooperation agreements with foreign universities-partners (Belgorod State University (Russia), Taras Shevchenko Transnistria State University (Moldova), Friedrich-Alexander-Universität Erlangen-Nürnberg (Germany). Under these agreements since 2003 the School has been inviting foreign linguists (namely Professor V. I. Karasyk (Russia), Professor D. Vanderveken (Canada) and others) who give lectures and conduct schools-seminars at the School of Foreign Languages and publish their articles in the Bulletin. 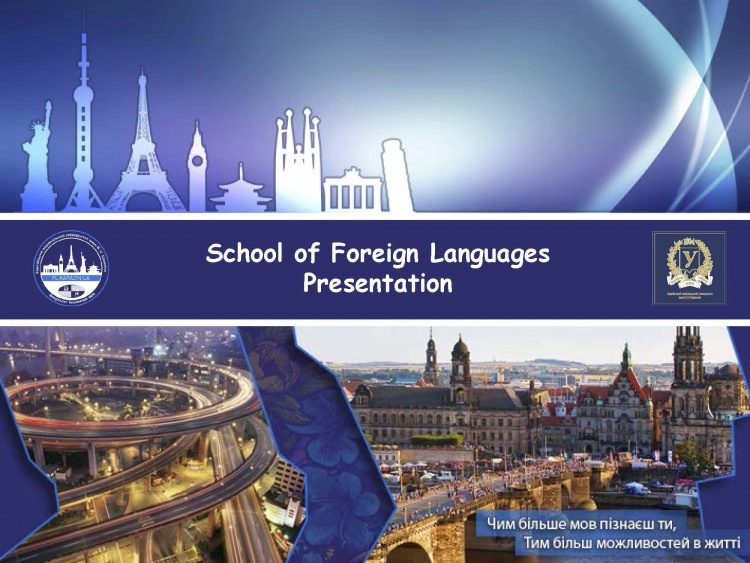 Students of the School of Foreign Languages are always enthusiastic about participating in conferences, meetings, seminars and having their own scientific articles published. 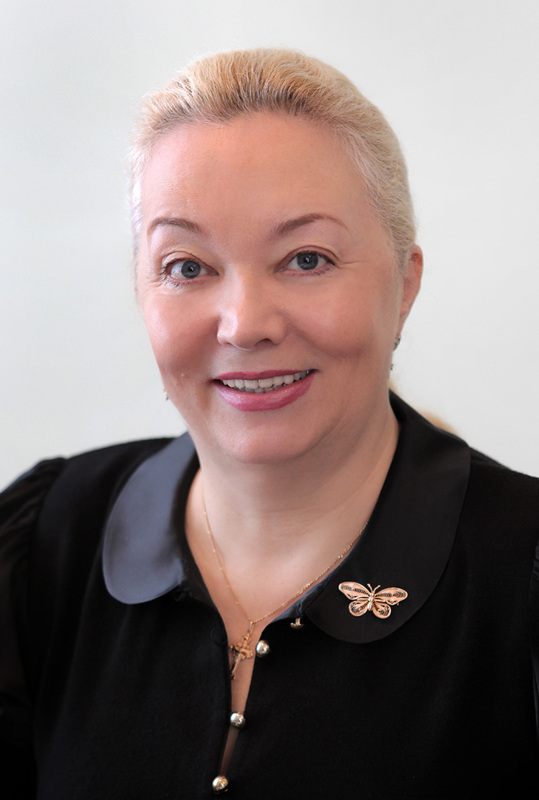 They tend to be prize-winners at numerous contests and competitions both within and beyond Karazin University. 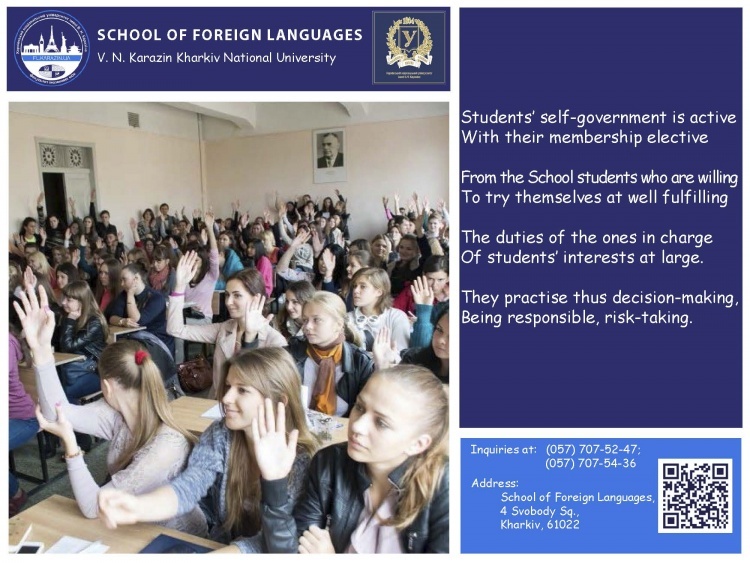 Moreover, the School has a well-organized system of student self-government. The Primary Trade Union Organization of Undergraduate, Postgraduate and Doctoral Students, the Student Scientific Society and Student Dean’s Office work hard to efficiently represent and defend rights of students.